Luckily the resort’s golf cart came and helped our researcher get up the hill to this worthy hotspot in Kata or else she may not have made it. 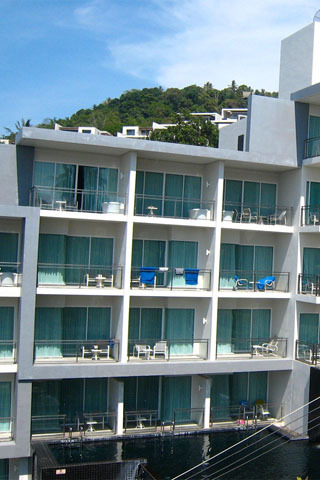 Sugar Palm is obviously a chain that has really done well for itself in Kata, with modern rooms and at this particular hotel, fabulous sea views from the top floors. There are various room types in the nine-storey building done in an industrial style, with bufferred cement floors and walls, giant tubs, waterfall showers, LCD TVs, safety deposit boxes and big comfy beds. The pool access rooms come with an Apple keyboard so you have full access to the internet on your LCD TV. To add, a welcoming gift of crocs and beach bag eagerily await your arrival. Only the seventh, eighth and ninth floor rooms have views so try to shoot for one of these to enjoy the beauty of the giant bay from your patio. All rates listed here are on the website and include service charge and tax but exclude breakfast.